BRAZITALIAN METAL TOUR for ALMAH and SECRET SPHERE will kick off on November 1st 2013. 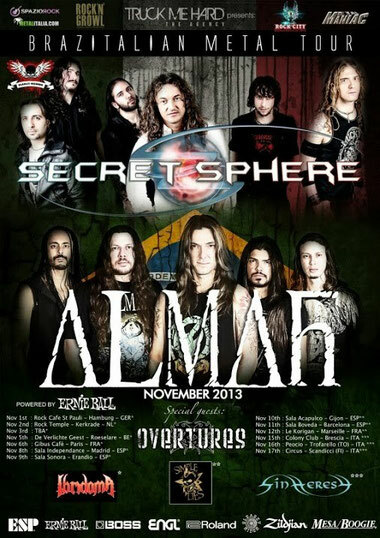 Brazilian metallers ALMAH led by former ANGRA's singer Edu Falaschi and Italian melodic metal band SECRET SPHERE will join forces for the co-headlining European tour. Italy's newcomers OVERTURE will support the complete route. In addition to OVERTURE, other 3 bands will share the stage. IBRIDOMA (from November 1st to 9th), SIMPLE LIES (from November 10th to 12th) and SINHERESY (from November 15th to 17th). See further information on each bands' website or Truck Me Hard Official website.